The coupons are valid after October 31 (you’re supposed to give them out instead of candy on Halloween) and can be redeemed by children under 12. EDIT: Some stores are offering different booklets — $1.25 for 9 coupons. Be ready for a curveball! I’ve found that the availability of these booklets are not guaranteed, so be sure to leave a comment if your location has them! I have been checking every McDonalds I pass on the west side of Portland and have not found any yet. If anyone finds a McDonalds selling them I would love to know where. I asked in Tualatin today (Nyberg McD's) and they said they won't be having them. :o( Bummed because I wanted to award them as prizes for our school's box tops drive. Let me clear that up 3 coupons of each item, that is! I purchased them in Longview yesterday and wanted to clear up a few errors. The packets are $1.25 each and include 3 coupons for free hamburgers, apple dippers, ice cream and juice or milk. I bought them last year in Tualatin and actually gave some of them out as halloween treats. They had an expiration date on them, I don't know if the new ones do. I don't remember but I think that they were good for only a couple of months. Thank you for asking out in Damascus. That is where I live and think that this is a great idea. 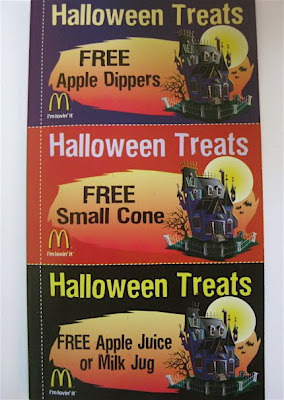 I asked at the Damascus McDonalds and the manager said they'd have them after the first of October.